The origin of the earliest John and William Rainwater, as well as their exact relationship, has long been a source of controversy among Rainwater researchers. The existance of the earier Robert Rainwater has been known for years as well but only a single record of him is generally reported. And no evidence proving a relationship between Robert and later Rainwaters has yet been found. While my wife, Susan, sticks mainly to the more pragmatic areas of genealogy and does the majority truly useful work, I have long been fascinated by the problem of these early Rainwaters. I have collected bits and pieces of evidence over the years, including three new references to the mysterious Robert Rainwater. We thought there might be others out there who would enjoy and possibly benefit from the information I’ve collected, so we decided to include my list on the Rainwater web site. My findings are presented here in chronological order with links to the original source documents where possible or at least descriptions of my sources. This collection represents an ongoing research effort and submissions of any documentation for early Rainwaters are always appreciated. If you have copies of an original source document that isn’t yet online or information that could lead to a new entry, please let me know! It is sometimes possible to make rough estimates of the ages of individuals mentioned in records based on historical and regional customs and laws. A male of age 21 or older could own land. Marriage of Abraham Raynewater and Mary Saudairle is recorded at St. Gregory church in Norwich, England. Tobias Raynemorter [Raynewater] is listed as a constable in Norwich City, Norfolk, England. In Yarmouth, Norfolk, England, at a meeting of the deputy lieutenants in Whiteharte, Wymondham Widdow Raynewatter is fined 40 shillings as a defaulter under the command of Capt. Thomas Pirpplett, esq. for defaulting 1666 July 10. The implication is that Widdow Raynewatter is one of the nonconformists following the advice of the nonconformist bailiffs who had encourages the town’s large dissenting element to oppose the Anglican Sir Thomas Medowe who commanded the Yarmouth militia. Tobias Rainemorter is buried at St. Katharine by the Tower, London. John Stevens, listed as the brother of Mr. Rainemorter is buried in the churchyard of St. Michaels in Cornhill, London. The Vicar General of the Archbiship of Canterbury issues a marriage license forAbraham Rainmorter, age 25, of St. Andrew Hubbard, London, Wine Cooper Bach., to Mary Sandall, age 23, of St. Botolph’s Aldgate, London, Sp. with her parents consent at St. Catherine by the Tower, London. Witnessed by William Austin, a Cordwayner of Stepney, Co. Middlesex. A marriage license is issued in the parish of St. Peter’s upon Cornhill to John Gerrard of St. Botolph’s, Bishopsgate, Bachelor & Widower to marry Mary Raynmorter of St. Andrews Undershaft, Widow. Colonist John Hurt receives a patent on 546 acres of land in King William Co., VA along the Pamunkey Neck of the Mattopony River under the importation, or head, right laws. 50 acres of land could be claimed upon presentation of proof of paying the transportation costs of an individual into the colony. In this case, John Hurt paid the way of 11 colonists. Among these indentured servants is Robert Rainwater. The transportation costs for a single colonist were approximately 6 pounds Sterling. Surry County, VA court records a payment of 400 lbs of tobacco to Robert Rainwater for two wolf’s heads. Surry County, VA court records a judgment for 300 lbs of tobacco plus court costs to be enforced by Sherif Stith Bolling against Richard Pace, the defendant, unless he appears to answer Robert Rainwater’s charges at the next session of the court. No information about the nature of the suit against Mr. Pace is given. Thomas Fussell’s family moves from New Kent Co, VA, where they had lived since about 1700, to Bertie Co., NC. They are known to have been in VA up until October 11, 1723 when the birth of Sarah is recorded in a Parish Register. They must have arrived in Bertie by 1733, because Thomas and his son Aaron are recorded as signers of a political document at that time. John Rainwater marries Mary Fussell. Mary was born about 1710-11 in New Kent Co., VA and would have turned 16 in 1726-27. In any case, the marriage has already taken place when Thomas Fussell’s will is recorded, so it must have occured in the 1727-1734 range. It could have occured in either Bertie Co., NC or New Kent Co., VA (assuming John and Mary moved along with Thomas Fussell). James was born before Dec 2 of 1734 (and if his brother John is older(?) he was probably born in late 1733 or early 1734). Thomas Fussell’s will is recorded in parish of Cartec, Bertie Co., NC. It indicates that his daughter, Mary is married to John Rainwater. The will states Thomas Fussell is somewhat sick in body and he is believed to have died shortly after this date. John Rainwater is granted 125 acres of land on the south side of Morratock River in Edgecombe Co., NC. John Rainwater witnesses a deed of land to Joseph Cooper by Gabriel Pickerin. The deed was for 100 acres on the Roanoke River for 5 pounds money of VA. Registered in Edgecomb Co., NC court. George Black is also a witness. John Rainwater’s mark appears on the deed. John Rainwater sells 150 acres of land on the south side of Roanoke river in Edgecomb Co., NC for 50 pounds proclamation money to William Rainwater. The land is part of a patent to John Rainwater made 1739 Nov 20. Witnessed by Richard Smith and Joseph Cooper. This is the first known reference to William. It is usually assumed that this William is a brother to John. To own land, William must be at least 21. If he were John’s son, John would have to have married Mary in 1721 when she was 12 years old. While possible, this is very unlikely. William Rainwater buys 25 acres of land in Edgecomb Co., NC for 10 pounds from Gabriel Pickren. The land joins John Rainwaters land. Witnessed by David Rozar, Robert West, and John Jones. John Rainwater sells 150 acres of land to Daniel Danbe of Northhampton Co. for 10 pounds current money of VA. The land is part of a patent to John Rainwater in Edgecomb Co., NC on 20 Nov 1739. Witnessed by P. Buxton and Robert West. John Rainwater sells 125 acres on the south side of Morratock river to John Noblin. John is living on this land at the time. The land was part of a grant to John Rainwater made 1739 Nov 1. Witnessed by David Rozar and Ralph Hutspeth. A deed of sale from John Rainwater to John Noblin is recorded in Edgecomb Co., NC court. Witnessed by David Rozier. This was the first business of the court on a Thursday morning at 8:00am. John Rainwater is appointed by the court of Edgecomb Co., NC to provide a room for John Jones, overseer. The court seems to be assigning the overseers of several county construction projects (roads, bridges, and a jail) to stay at homes near the construction sights they will oversee. This occurs on the same day that John Rainwater appeared at court to have a deed recorded so it may have been his proximity to the court rather than his homes proximity to the construction project that influenced the courts decision. John Rainwater buys 160 acres of land in Edgecomb Co. NC, from William Reeves, Jr for 50 pounds sterling money of England. Witnessed by Robert Harris, Leminder Harris, and Christopher Hains. A later deed for the same land references this transaction. John Rainwater, a planter, and his wife Mary sell 160 acres of land at Jenneto meadows Edgecombe Co, NC for 100 pounds sterling English money to Robert Williams. This land was previously owned by William Reeves. The land is said to be on Quonque swamp. Witnessed by William Green, Franics Williams, and Richard Bagly. A later deed for the same land in 1759 references this transaction. William Rainwater (probably the elder John’s brother) sells 12 acres of land in Edgecomb Co., NC on the south side of the Roanoke River to Gabriel Pickren for 20 pounds current money of VA. The land was part of a land patent to John Rainwater made 20 Nov 1739. Witnessed by David Rozar and Richard Cagley. William Rainwater (probably the elder John’s brother) witnesses a deed of land sold to Nathaniel Merrit by Gabriel Pickren in Edgecomb Co., NC. Williams mark appears on deed. William Rainwater and wife Ann sell land in Edgecomb Co., NC on the south side of Roanoke river to Nathaniel Merritt for 20 pounds sterling money of England. The land joins part of grant to John Rainwater. Witnessed by David Rozier, Reuben Rozier, and Ann Rozier. This is the only known reference naming William’s wife. It is worth noting that William’s older brother, John, married Thomas Fussell’s daughter Mary and that Mary had a younger sister named Ann. James Rainwater (probably John Rainwater’s first or second son) appears on the muster list of Captain Sugar Jones’ company under the command of Colonel William Eaton in the Granville county regiment of the NC Militia. Roster of Colonel William Eaton’s Granville County Regiment is endorsed by Granville official. The roster lists James Rainwater (probably John Rainwater’s son) and John Rainwater (either the James’ father or brother) along with Aaron Fussell (Thomas Fussell’s son) under the command of Captain Sugar Jones. The other John Rainwater (again, either the father or son) is listed under the command of Benjamin Simm. John Rainwater has a warrant issued to Captain Sherwood Haywood, Deputy Surveyor to survey 640 acres of land on the south side of Sandy Creek in Granville Co. at the first falls above Rainwater’s Plantation and including Rainwater’s Plantation. The warrant was entered 1753 Sep 6 and a deed issued on 1755 May 9. John Rainwater and James Rainwater "son of John" listed in Granville Co., NC as taxpayers. John Rainwater purchases from John Earl 480 acres of land in Granville Co., NC on both sides of Sandy Creek. His mark appears on the document. Deed Book H.
William Rainwater (probably John’s brother) and Nathaniel Merritt witness the will of John Nobleland in Edgecombe Co., NC. John Nobleland is very sick at the time. William Rainwater’s mark appears on the document. John Rainwater sells 100 acres on south side of Sandy Creek along Rainwater’s line in Granville Co. to Jacob Crocker for 20 pounds. This land was part of 480 acres granted May, 1755. James Rainwater is one of three Sworn Chain Carriers on a survey of 482 acres of land for John Carley in Granville Co. NC in the Parish of St. John on both sides of Richland Creek. The land adjoins Thomas Fussel’s land and is purchased by Shurley Whatley on 1757 Nov 9. A Sworn Chain Carrier was someone asked to assist an official land survey because of some knowledge of existing survey lines. This was often the son of a nearby land owner. James would have been 20-22 years old by most guesses at this time. James Rainwater buys 125 acres on both sides of Sandy Creek in Granville Co. from John Rainwater (probably the elder John based on the location of the land being sold) for 10 Pounds. Witnessed by Aaron Fussell. James must have reached the age of 21 by now in order to own land. This means James must have been born by on or before Dec 2 of 1734. John Rainwater (probably the elder John) buys 212 acres on both sides of Sandy Creek in Granville Co. on John Terrell’s line from Thomas Fussell for 12 pounds. Witnessed by Aaron Fussell, John Stroud, and Edward Weaver. John Rainwater (probably the elder John) buys 7 acres on north side of Sandy Creek in Granville Co. from John Terrell for 10 pnds. Witnessed by Aaron Fussell, Edward Weaver, and Elio Fussell. John Rainwater (probably the elder John) sells 130 acres on north side of Sandy Creek in Granville Co. to John Halcum (Halcomb) for 14 pnds, 14 shillings, 6 pence. John Halcomb is said to be living on the land at the time of the transaction. The land is part of 480 acres granted May, 1755. Witnessed by James Rainwater and Josh Yarbro. John Rainwater sells 125 acres on Sandy Creek in Granville Co., NC to John Stanfold (Stanfield) for 10 Pounds. John Rainwater and William Rainwater witness a deed of sale of land from Wm. Oglive Sr. to John Norwood in Halifax Co., NC. Both Rainwater’s marks appear on original document. John Rainwater sells 112 acres on the south side of Sandy Creek in Granville Co., NC to John Foster for 100 pounds. Witnessed by Hez. Terrell and Reuben Lawson. James Rainwater is recorded in the Bear Bare Swamp District of Granville Co., NC, with one person eligible to be taxed, probably himself. John Rainwater, his son John Rainwater and Jonathan Peaser are recorded in a single household in Goodwin’s District of Granville Co., NC, all three men being taxable. William Rainwater sells 118 acres of land in Halifax Co., NC to George Norwood for 100 pounds of Great Britain. Witnessed by Nathaniel Merritt and Benjamin Harrison. The land sold borders land owned by Rainwater and Merritt. John Rainwater sells 220 acres on Wilson’s line on Lick Branch in Granville Co., NC to Hezekiah Terrel and his wife Phoebe for 100 pounds. Witnessed by John Rainwater, Jr. and John McGlemore. One John is the father and one the son but until a more detailed study of the land ownership can be made, it’s hard to say which is which! James Rainwater and John Rainwater listed as taxpayers in Bute Co., NC. Moses Rainwater witnesses the sale of property from Allen Monjoy to John Langston, both of Bute Co., NC. John Rainwater serves on a Bute Co., NC jury for two cases. John Rainwater buys 112 acres of land from Abraham Baget in Bute Co., NC. Witnessed by Benjamin Hill. William Rainwater witnesses a deed of sale of 100 acres of land from Jonathan Carpenter to William Carpenter Sr. in Halifax Co., NC. Document is said to have William Rainwater’s mark. John Rainwater serves on a Bute Co., NC jury for three cases. John Rainwater & wife Mary register a deed of sale of land to James Miles in Bute Co., NC court. Witnessed by John Cole. John Rainwater petitions the Bute Co., NC court to exempt his son William Rainwater from taxes and other public services because of his being an idiot. The court so orders. John Rainwater registers a deed of sale of land to Benjamin Hill in Bute Co., NC court. John Norwood is a witness. John Rainwater, Jr. listed as taxpayer in Surry Co., NC. John Rainwater registers a deed of sale of land to Benjamin Hill in Bute Co., NC court. Sampson Bobo is a witness. John Rainwater’s will is written Surry County, NC. It lists his daughters Mary, Sarah, Betty, Winney, Milley, and Molley; his sons James, John, and William; and his wife Mary. James is made the trustee of the estate. James is to see to the maintenance of Mary and William (who is mentally retarded ). Should James die while Mary or William still lives, John is to take over as trustee and see to their care. The interesting thing to note here is that, contrary to tradition, James rather than John would seem to be the older son. John Rainwater Sr. and James Rainwater listed as taxpayers in Surry Co., NC. James Rainwater (probably John’s son) registers a deed of sale of land to Jacob Bass in Bute Co., NC. Mathew Thomas is a witness. William Rainwater witnesses the sale of land by Susannah Reed to Moses Myrick, both of Bute Co., NC. William Rainwater, Sr. and William Rainwater, Jr., witness the sale of land by Alexander and Mary Anderson of Bute Co., NC to Henry Beauford of Amelia Co., NC, paid in “Virginia” money. Widow Rainwater listed as taxpayer in Surry Co., NC. This is most likely Mary, John Rainwater’s wife. John Rainwater’s will filed in Surry Co. NC. It is likely that John died prior to this date. William Rainwater’s land is mentioned as adjoining 200 acres on which a warrant was issued to James Adams in Halifax Co., NC. William Rainwater (John’s brother or nephew?) 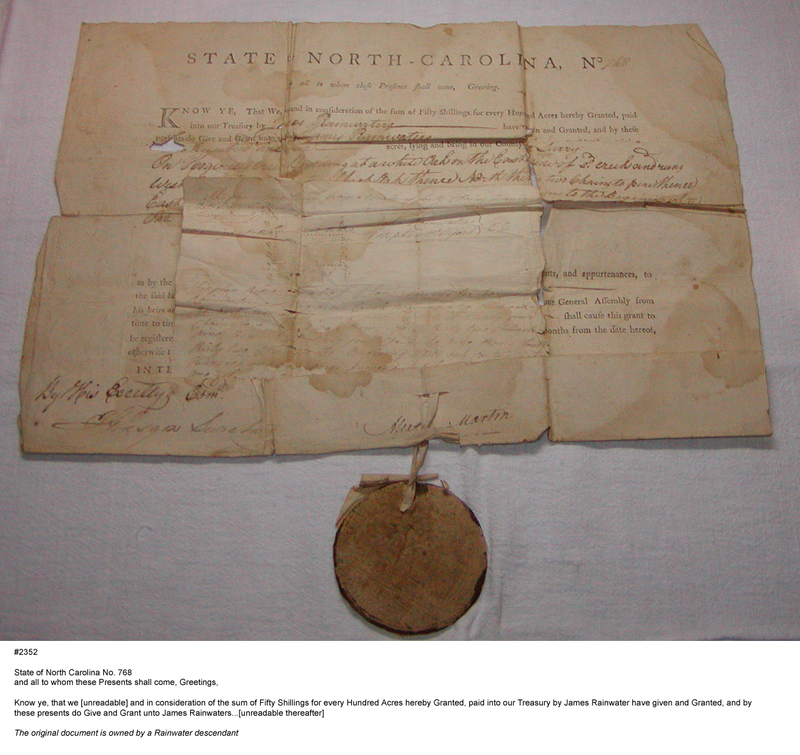 is witness to a deed of sale of land from Alexander Anderson and his wife Mary to Henry Beauford in Bute Co., NC. James Rainwater enters 200 acres on Fishers River adjoining land of John Jarvis in Surry Co., NC into the land entry book of Surveyor Joseph Winston. A Warrant for the land is granted. John Rainwater (probably John’s son) is paid 50 pounds by NC for providing corn. Anne Rainwater (probably William’s wife) received a deed to land in Granville Co., NC as a "gift from her friend", Nathaniel Hix. William Rainwater (John’s brother) paid 8 pounds, 18 shillings by NC comptrollers office. James, Mary and John Rainwater (John’s son) listed as NC taxpayers in Surry Co. Arm or Ann Rainwater listed as taxpayer in Halixfax Co., NC. (unknown) Rainwater was paid an unknown amount by the NC comptrollers office for Revolutionary War related services. Gilliam Rainwater is paid 4.8 pounds by the NC comptrollers office for Revolutionary War related services. Unknown relation, possibly the son of the earliest William Rainwater? Moses Rainwater listed as NC taxpayer in Johnston Co., NC Most likely the son of James Rainwater. Later census records for Moses make him about 16 years old at this time. William Rainwater listed as NC taxpayer in Warren Co., NC. Probably the son of the earlier William Rainwater. Jacob Reinweiter baptized at Lowerstone Reformed Church of Rowan Co., NC. Warren Co., NC census of Capt. Colclough’s District includes William Rainwater, whose household contains 1 white male age 21-60, 2 white males under age 21 or over age 60, and 4 white females. William Rainwater is bound Apprentice to Robert Burch until he reaches the age of 21 by the Johnston Co., NC court. He is said to turn 13 on the "3rd day of June next". There are probably two young William Rainwater’s in Johnston Co., NC at this time unless this one marries at the age of 13 (see next entry). Moses Rainwater witnesses the will of Robert Bunch. His mark is said to be on the document. The will is probated in 1788 Feb.
William Rainwater marries Molley Reaves67 or Medley Rives422 in Johnston Co., NC. Gilliam Rainwater marries Nancy Christmas in Warren Co., NC. Unknown relation, possibly a son of the earliest William Rainwater? James Rainwater receives power of attorney from Abraham Howard of SC to sell William Silvey his land on Double Creek of Yadkin River. Witnessed by Edmond Pace. Recorded in Surry Co. Court in May of 1790. For additional information on the meaning of the numerical information see the key on the census page. James Rainwater is among a group of Surry Co., NC residents ordered by the County Court of Pleas and Quarter Sessions to "mark and lay out a road the nearest and best way from Cornelius Reich’s old place into the Hollow Road to Rockford and make a report thereof to the next court". Nuseham Rainwater witnesses a deed transfering 70 acres of land on the north side of the Neuse River in Johnston Co., NC from James Lockhart to John Smith. The document is said to contain Nuseham Rainwater’s mark. Moses Rainwater witnesses a deed transfering 200 acres of land on the south side of the Neuse River in Johnston Co., NC. from John Smith to Elijah Walter. The land is mentioned as being near the land of a "John Rai...." (not legible by the transcriber). The document is said to include Moses Rainwater’s mark. William Rainwater is listed as an insolvent in a report to the Johnston Co., NC court by the sheriff. James Rainwater of Edwards District, Surry Co,. NC presents evidence in court that he has been "taxed with two polls for the year 1792 more than he has a right to be taxed with" and is released from his obligation to pay the overage. Nusom Rainwaters is one of several buyers at the estate sale of John Brady in Johnston Co., NC. William Rainwater is on a list of insolvents prepared by the Sheriff, Henry Gray, of Johnston Co., NC. Elizabeth Rainwater marries Daniel Collins in Richmond Co., NC. 69: Surry County Court Minutes Vol. I, 1768-1785, abstracted by Mrs. W. O. Absher & Mrs. Robert K. Hayes, Sr.
70: Surry County Court Minutes Vol. 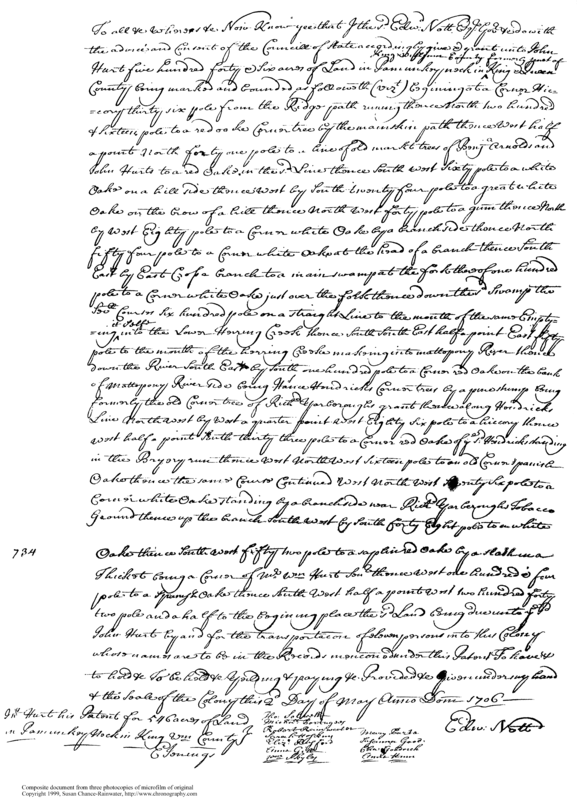 II, 1786-1789, abstracted by Mrs. W. O. Absher & Mrs. Robert K. Hayes, Sr.
219: Deeds of Halifax Co., NC 1758-1771, by Stephen E. Bradley Jr.